Craftsman Golf’s mission is consistent from beginning to end: to make the best golf head covers! They believe that your golf head cover set reveals your style, spirit, and attitude.They believe every golfer is unique, and that your golf head covers should be too. You can buy a wide variety of predesigned head covers for your driver, woods, hybrids, irons, and putter. Majority of their head covers consist of different patterns of synthetic leather (glossy leather, crocodile pattern and lychee pattern). They also offer neoprene, acrylic yarn, denim, synthetic leather and neoprene combos. Other golf accessories that customers can purchase are hats, Sunday bags, ball markers, golf ball bags etc. The head covers that I trialed were all made of “premium synthetic leather”. When I first realized that these head covers were not real leather, I did not expect them to be as durable as they turned out to be. It got me interested in synthetic leather. So I started doing some research. I compared the difference between synthetic and authentic leather. Faux leather, or imitation leather, refers to any material that resembles the look and feel of genuine leather. The materials range from flexible fabric to plastic, sometimes even paper. It is then coated, embossed or printed to simulate the appearance of real leather. Artificial leather and synthetic leather are also two of several names commonly used to describe faux leather. There are 2 kinds of faux leather: 1. PVC Leather -PVC leather is a type of faux leather that is made by covering a base of natural or synthetic material with vinyl, made from polyvinyl chloride (PVC) and plasticizers. -PVC has no pores which makes it virtually waterproof, but may become unbreathable in hot temperatures. -Due to its plastic nature, PVC leather requires no special care or conditioning in comparison to genuine leather, but may crack with extended use because of the application of plasticizers. 2. Polyurethane (PU) Leather -PU leather, also known as bicast leather, bycast leather or split leather, is made by covering a backing fabric such as cotton, polyester or shredded leather with a layer of polyurethane. -It’s surface can be treated to look and feel like real leather, which makes it the most common faux leather these days. -Unlike PVC leather, PU leather has microfibre pores, which allows it to “breath” better than PVC, but still easy to clean and maintain like most plastic. -In some regions, people consider PU leather as genuine leather when a stratified layer of animal hide is used as backing. -However, PU leather neither develop a patina nor exhibit characteristics associated with aniline leather. Therefore the use of terms like “leather”, “genuine leather” or “100% leather” in relation to PU treatment is not permitted in countries like Denmark, New Zealand, and United Kingdom. Reference:Faux Leather: PU , PVC , and Bonded Leather Now back to Craftsman Golf… I have not had any issues with the golf head covers. I play golf at least 3 times a week during the summer and fall, walking 18 holes. The color on the head covers look like new, the stitching, velcro and elastic on the bungee closure still remains in tact. The iron set head covers and the putter head cover have a nice padding to them which provides good protection when the clubs hit each other. I find the “skull” driver and woods head cover on the other hand to be on the thinner side for padding but nevertheless it still provide good protection. Also, I was skeptical of the bungee closure on the driver and woods head covers because I thought the elastic will wear out with the consistent motion of taking the covers on and off….but so far so good. Is PU leather the choice for you? 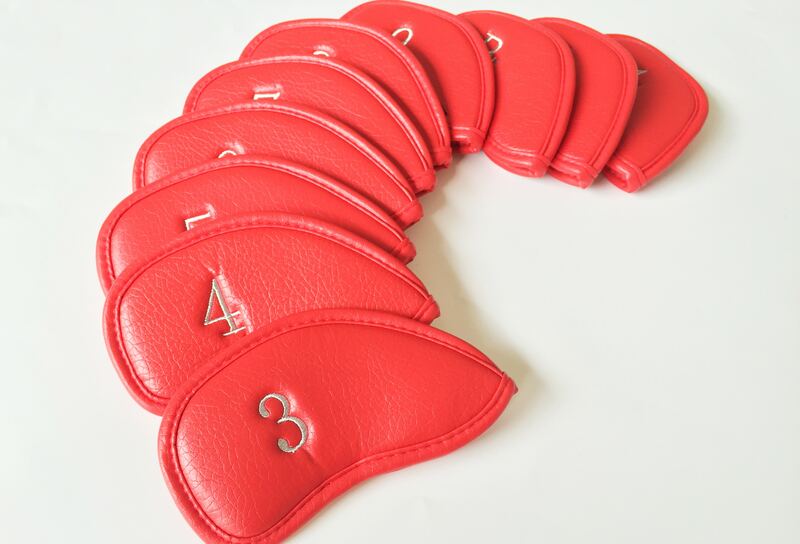 PU leather head covers on Craftsman Golf are more affordable compared to real leather head covers. For example, the “Skull Blue” (1 driver, 2 woods, and 1 hybrid) head covers set is 30$ USD on Craftsman Golf, and it is 55$ USD for 1 “cowhide” driver head cover on “bestgrips.com”. 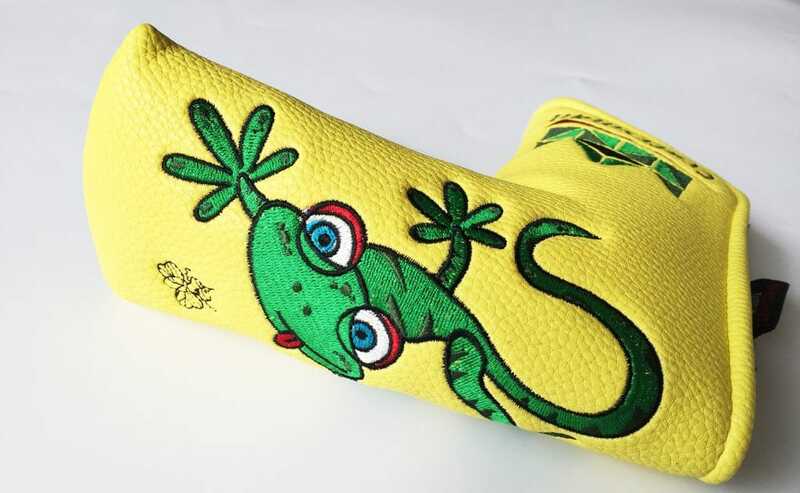 Another example, the “Gecko blade” putter cover is $25.90 USD on Craftsman Golf, and a genuine leather blade putter cover is $39.00 USD on “stitchgolfonline.com”. So it is undeniable that “real” leather golf head covers are more expensive than synthetic leather. Aside from price though, what are other advantages from synthetic head covers? -More styles to choose from. Usually real leather head covers are very simple and plain. Also, if you want any design added onto it, it is an extra charge on top of the already expensive head cover. -Lower maintenance with synthetic leather. They are less porous therefore liquid do not seep into the cover, essentially making it waterproof (good for rainy golf days). Often you will get dirt or mud on your head covers from playing 18 holes, its inevitable.. you can simply use soap and water to wipe clean on PU leather. -You can switch up golf covers more often. If you are the type of person that likes to switch golf covers up, PU leather is not as expensive as leather and generally won’t last for generations, you can buy a new set of head covers changing up the look of your golf bag without feeling guilty. -PU leather can be free of animal products, so it is “vegan” friendly. You just have to make sure the backing does not consist of stratified animal hyde. Leather option is better for you when… -You are the type of person that likes the “classics” and keep your head covers for a long time without having the urge to replace them. I believe that leather will outlast PU leather. I have not compared a real leather golf head cover to a PU head cover, but I have owned a PU leather jacket and a leather jacket. The leather jacket is still in my closet where as my PU leather jacket ended up in the landfill after 3 years of consistent wears. -You like to take the time to care for your products. Leather products require more care compared to PU leather. “They look great, however, I have had following problem… the “Velcro” is just a very small piece and I have had one of the covers fall off twice in their very first use outing. We all know what its like going back to your previous hole looking for head-covers, well this is what happens with these. Its only a matter of time before I lose one….UPDATE: I have now lost 5, and I am purchasing another type of head cover, one’s that will not fall off during a round of golf. The ONLY thing they would be good for is if you are shipping your irons, DO NOT PURCHASE if you want to use them to protect your irons during a round of golf, unless you have someone following you around to pick them up when (not if) they fall off.” “covers fit hybrids nicely but have no durability. They began cracking within 2 weeks” “Very loose. Fly off while driving cart. Lost 2. Quit using them.” “Difficult to keep on clubs I replaced them within 3 or 4 rounds” “Velcro ripped on one item already” “Didn’t fit my ping irons.” Leather Iron Head cover Set Amazon.com Customer Reviews Wood Covers: There was only one 5 star rating for the woods head covers, keep in mind people like different styles. With only one rating you can’t give any evidence for or against the product however other woods covers from Craftsman Golf received good ratings on amazon. “I ordered 2 for 2 clubs. 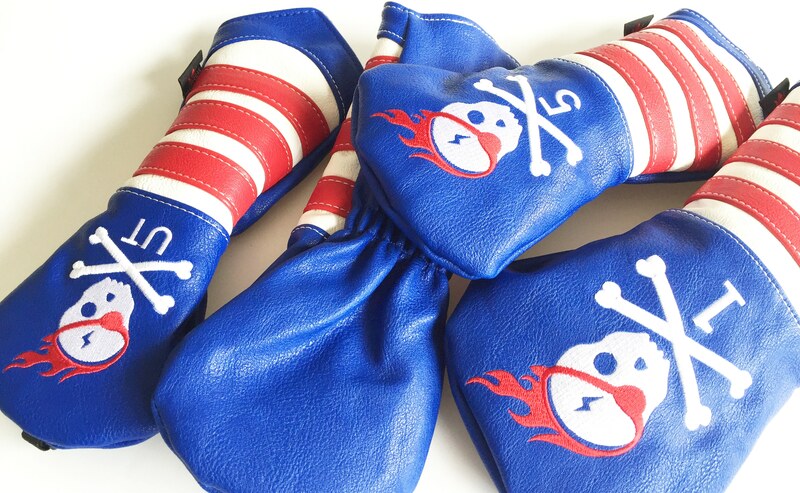 They fit great and look even better.” Skull Blue Leather Golf Head Covers Amazon.com Customer Reviews 1 Skull Blue Leather Golf Head Covers Amazon.com Customer Reviews 2 Putter Covers: There where 3 Reviews that rated the head cover 5 stars. Again 3 reviews is not enough for statistical significance. But on the other hand the trend of good reviews on their products continues throughout Amazon. To wrap it all up, the trialed Craftsman Golf head covers held up nicely. I have not lost any of the covers which shows that the covers attached onto my golf clubs securely. I golfed in rain, and high heat and the color on the head covers are still bright and vibrant as the day I received them. The stitching, velcro, magnet, and elastic are also still in great shape. I did not find the head covers softening up though, which could be because it is made of synthetic material (although, the material is not tough to begin with). It is easy to slide the head covers on and off so I did not find it interfering with my many rounds of golf. The customer reviews listed above are from Amazon and were on the head covers I trialed. Only the iron covers had a large number of customer reviews, 75% of the reviews sat in the 5 stars category. That is a strong indication of the iron covers being a good product. Unfortunately, there was less feedback for the wood covers and putter cover, therefore a strong conclusion about these products could not be drawn from the small amount of reviews listed. I personally find these head covers by Craftsman Golf are made of high quality and are offered at an affordable price. Even though they are not made of real leather, the appearance of these head covers do not look cheap. The wood head covers for example resemble the real leather head covers style sold on stitch.com, and bestgrips.com but for 1/3 of the price. If you are someone that values leather products though, you may not be satisfied with synthetic head covers because no matter how close a company tries to make a product look like leather, it still misses some leather qualities. For example, the softness overtime, and patina. I do recommend looking around on Craftsman Golf website and Amazon.com before you make a purchase. I found that sometimes you can get a better deal on Amazon.com compared to the Craftsman Golf’s website, and vice versa depending on the head cover.